Ginger Puss was an old gentleman cat of seventeen years when we moved here to the country. He settled in immediately, taking up residence under the decking and totally refusing to enter the house. There was no way to entice him in. Yet he was incredibly friendly, as long as people came to visit him. He welcomed company on his decking, and would immediately emerge, squeaking and purring loudly. We used to say that he sounded like a chainsaw. Ginger Puss was brilliant cat company for gardeners - first you'd hear his penetrating rumbling purr, and then he would appear out of the undergrowth squeaking and miaowing. The cat was happy to stay with the gardener for hours. I don't think Ginger Puss ever forgave us for getting the dog. Though he was big and feisty and stood his ground whenever the dog bounded up to him, he never learnt to relax. His stubborn refusal to enter the house was his dog protest. 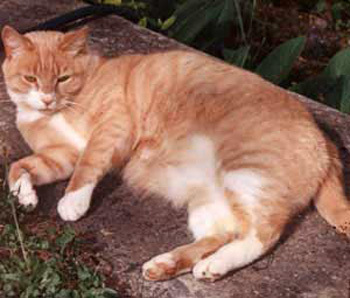 When Ginger Puss Cat was eighteen years old his health began to decline. Eye drops were prescribed, but his sight started to fail. 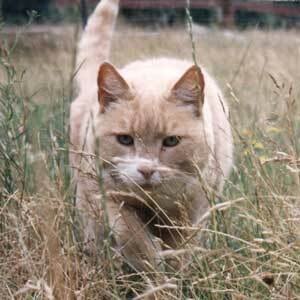 Cat senility caused him to wander off, forgetting mealtimes. One day he disappeared for good, and we understood that Ginger Puss had chosen his final resting place. I eventually found him (actually I smelt him) while working in the Pond Border. He had expired near the pump-house, in a bed of dry leaves. I wouldn't have found him just by looking. Ginger Puss was buried under a standard rose in a garden which in summertime is full of daisies. He is one of the enduring cat legends in Moosey's Country Garden.